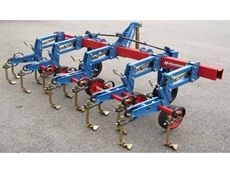 Cultivators ideal for row cropping cultivation, ridge scuffling and post planting tilling. 11/11/10 - The 5-160 cultivators available from CSN Machinery are suitable for secondary tillage and used in seeding operations in conjunction with an Airseeder unit. 10/11/10 - CSN Machinery offers a new range of multipurpose cultivator machines designed for conventional and conservation farming.